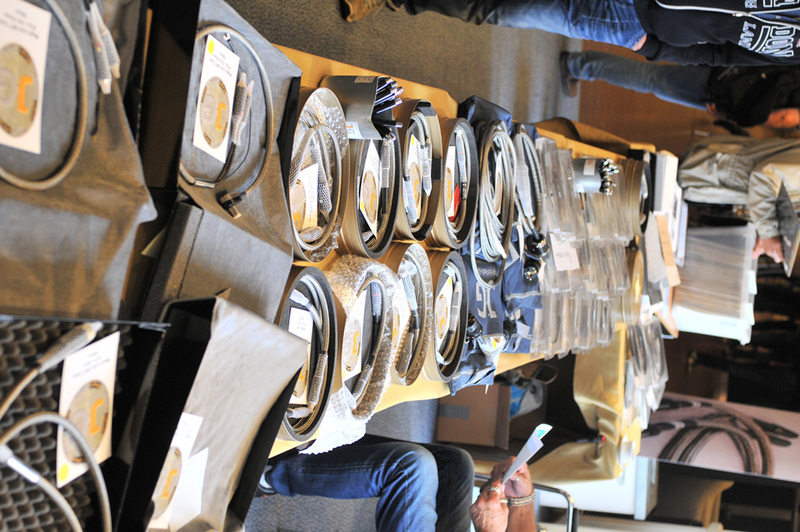 This year Casper Bunge and Ton van der Vreeken organized our largest domestic audio show for the seventh time. 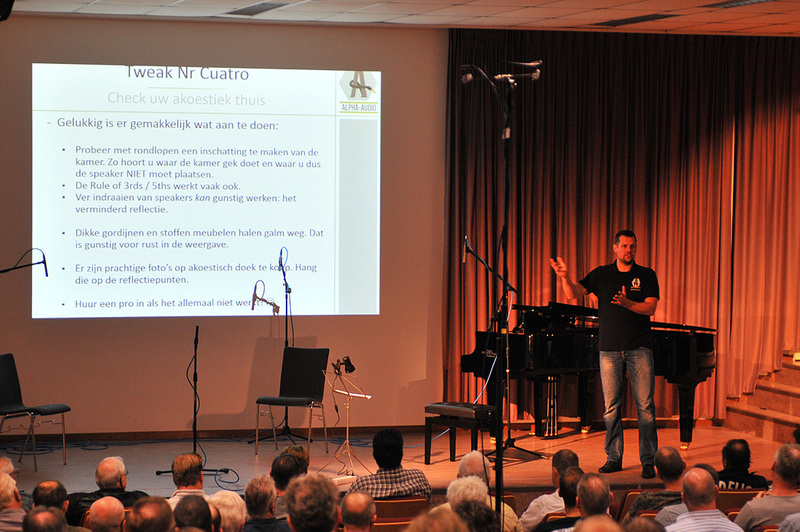 Their venue of choice was once again the monastery-turned-conference-center of the Koningshof in Veldhoven, near Eindhoven/Holland. With many rooms small and large and an auditorium, the location is ideal for an audio show; except that the layout of the conference center with its rooms around multiple courtyards can disorient the unprepared. Having done this show in years past, we were prepared. After arriving the Friday afternoon before show opening, we not only stayed in the venue's hotel, we also studied the layout of the event to create a roadmap for the two days we would attend. With over 65 rooms to cover, such a strategy is not only necessary but very helpful. In the following report we cover most rooms briefly and dive deeper into discoveries we found interesting, intriguing or just fun. 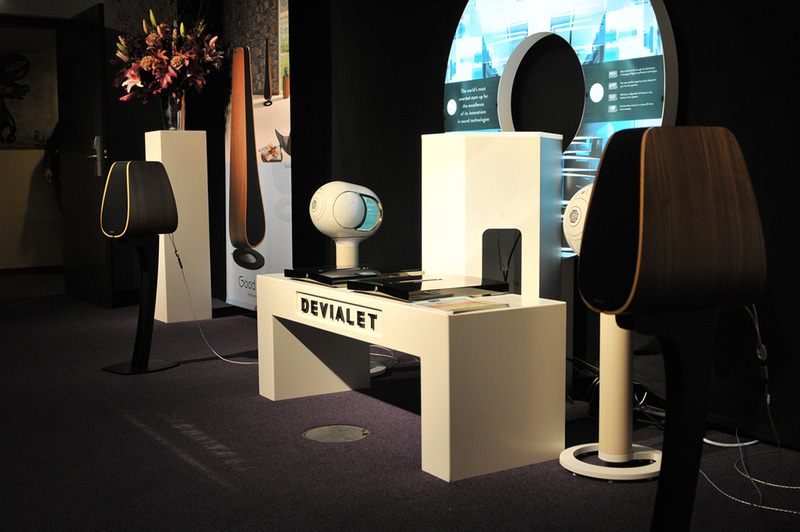 When we entered, Devialet were fortunately playing their model 200 in mono fashion into Davone Studio two-way monitors. We much preferred this setup to their Phantom ‘boom box'. Crystal Cable this time around sat it out on static display with their vertical integrated amplifier and Minissimo Diamond monitors. ... but also the True Blue Box amplifier controller. This is wrapped around the Axign AX5689 PWM controller chip. With 8 controller slices and 8 ADC built into the chip, this Class D controller is in fact a 50wpc power DAC with 105dB dynamic range; or 114dB when the ADC are set to parallel mode. Sample rates of 44.1kHz to 192kHz are processed with 16 to 32-bit inputs. 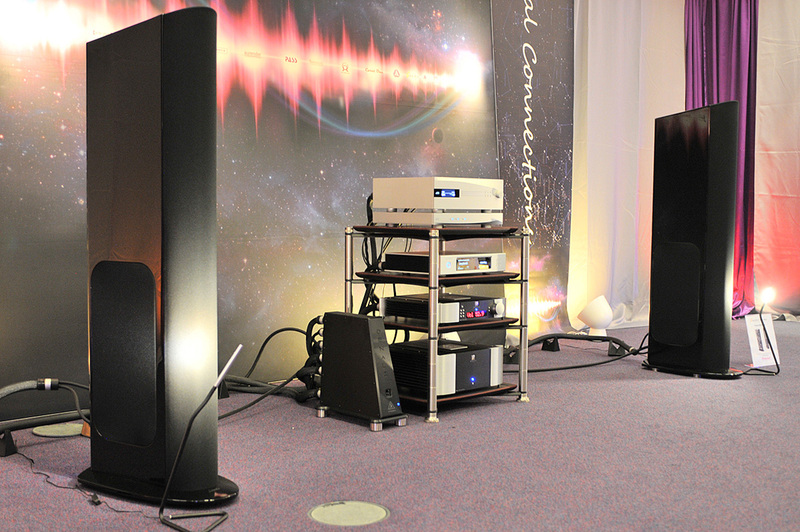 Loudspeakers of choice were System Audio's Saxo 70 as the white floorstanders in the photo. Vinyl is still here to stay and many turntables on static or active display drew plenty of attention. 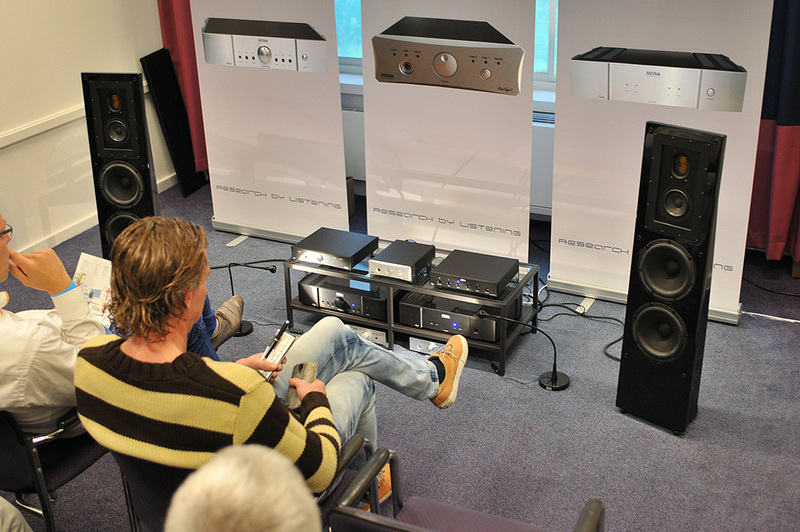 A large and interesting room offered a demo of the Bloomline Omniwave loudspeaker system. 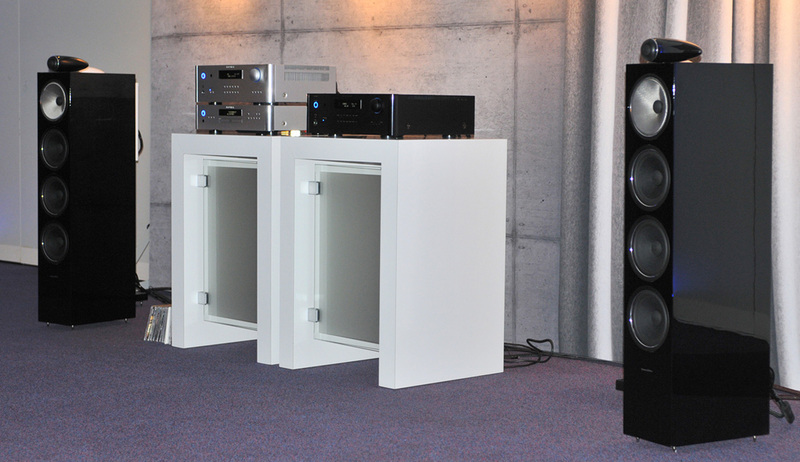 Designer Leo de Klerk explained the limitations of classical loudspeaker designs and highlighted the benefits of his four omnidrives in a compound setup. In his opinion, classical speakers betray their location whenever the listener turns her head slightly. "A virtual OmniWave speaker provides sonic stability for any position of the listener. OmniWave is a building stone for continuous phantom imaging, which is the means for the creation of a free scalable 'sweet room' without limited sight lines." In practice one Omnidrive was mounted relatively high firing downwards while a second Omniwave speaker mounted in close proximity to the floor firing horizontally. We had to admit that their demo was convincing and ranged from conventional glued-to-the-speakers images to an open and very realistic image when the Omniwave system was fully active. And let there be live music our busy Dutch music gods commanded! 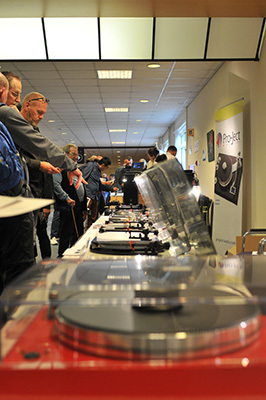 At a hifi show, real music is not only enjoyable, it reminds us of the differences to playback. No matter how good the recording or system, there will always be a difference. Our artist in residence was Eric Vloeimans who performed four times during the shows's two days. He was accompanied by string quartet. Fritz de With of STS Digital not only presented his wares, he brought a large part of his recording kit to capture another live performance, that of the Harbour Jazz Band soon to be released on vinyl. 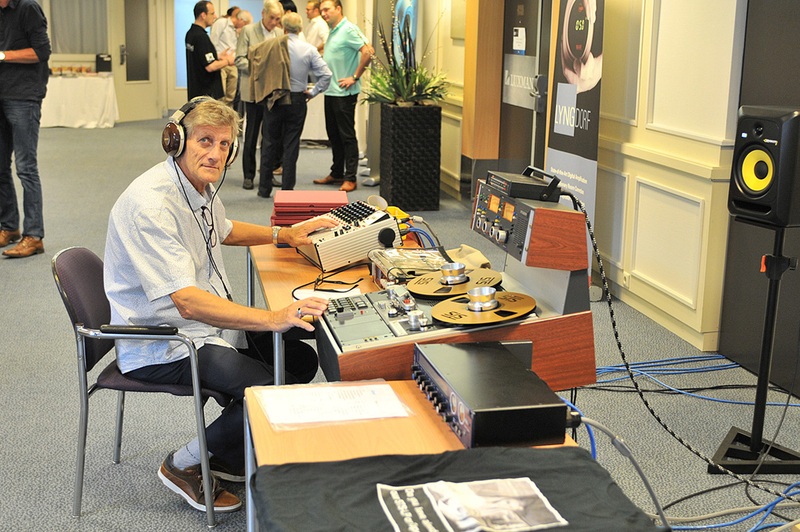 While at it, he also cut some Eric and quartet with a simple microphone setup whose output fed his Studer tape deck. Funnily enough, his location monitors were probably the cheapest loudspeakers at the show – the €200 active KRK Rokit8. When we unexpectedly turned a corner meters away from his rig, he played a cut from his Eric tape and we were most surprised to see that it wasn't Eric, live on the spot. Getting closer and more into the field of the speakers, the live illusion diminished to reveal more ‘hifi'. This experience proved two things. One, a great recording is a simple unaltered straightforward recording. Two, good monitors don't have to be expensive. More Eric Vloeimans coming up later. JG audio cables is John van Ghent's brand and his wide range of cable types lacked for no visitor attention. With an auditorium on hand, it could be used for performances or presentations. One of the latter dealt with optimizing the sound at home; always a good subject. Of course playing music at home can be done in various ways. 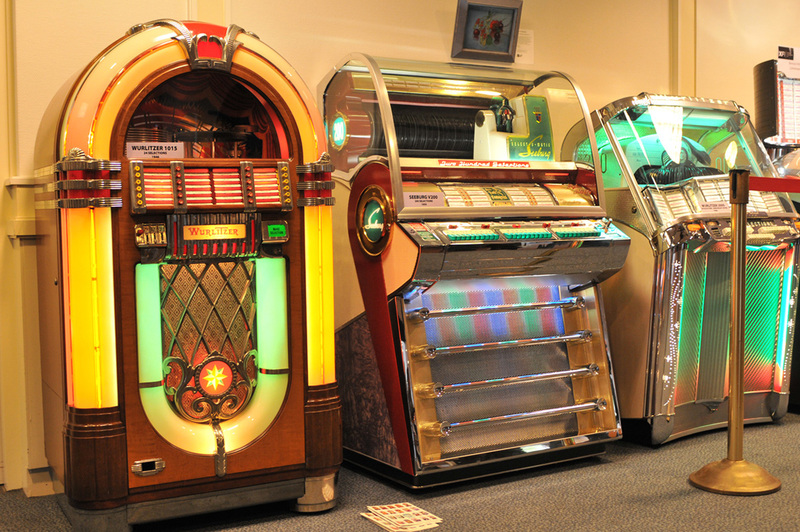 Why not with a vintage or new jukebox? Bennies Fifties had quite a few of those. 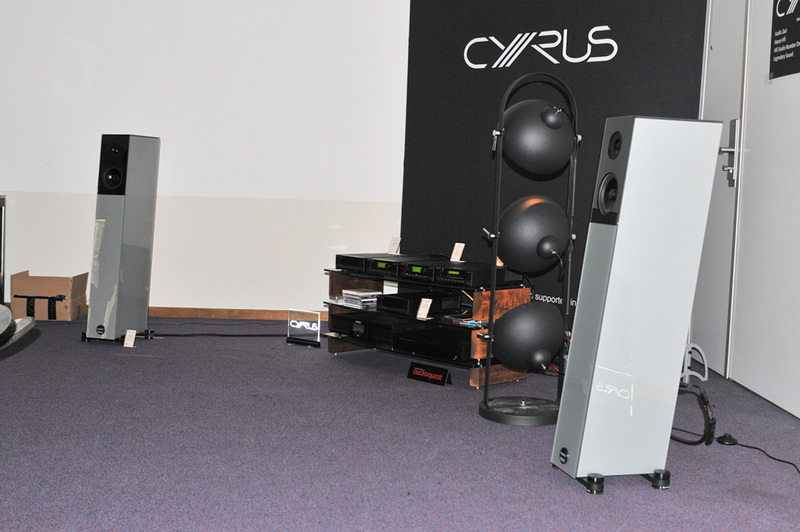 A big room with a Cyrus set crammed into a corner and a big spot-light construction between the Audio Physic Virgo speakers had us wonder. 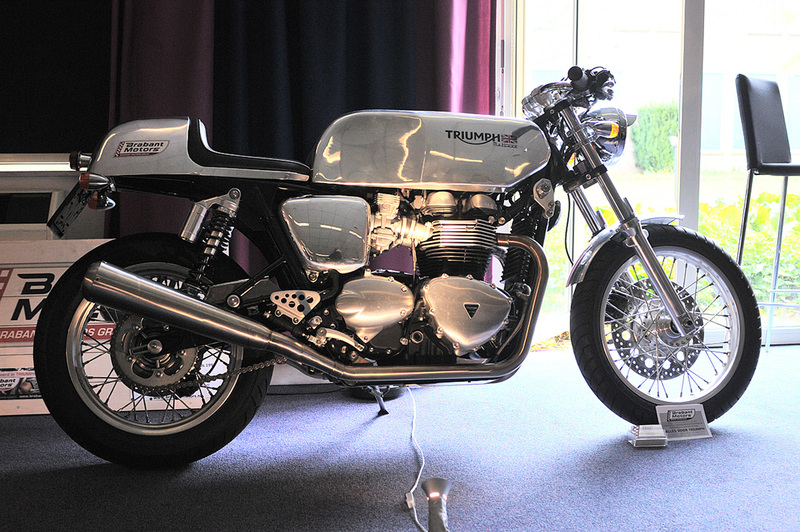 More interesting was the Triumph Thruxton Metisse tuned and tweaked to the max. Even though Ken 'Mr. Marantz' Ishiwata was absent, his ideas weren't. In the Marantz room the demo set was set up as Ken does it - with extreme toe-in for the loudspeakers. Behind their covers, the Triton Reference by GoldenEar hides no less than ten drivers, one of which is a high-velocity folded ribbon or AMT tweeter. Three active woofers are assisted by four passives and powered by dedicated built-in amplifiers with DSP support. Electronics were Moon pre and power amps with a dCS Rossini DAC and Aurender N10 streamer. Bowers and Wilkins demoed their 700 and 800 Diamond series loudspeakers. 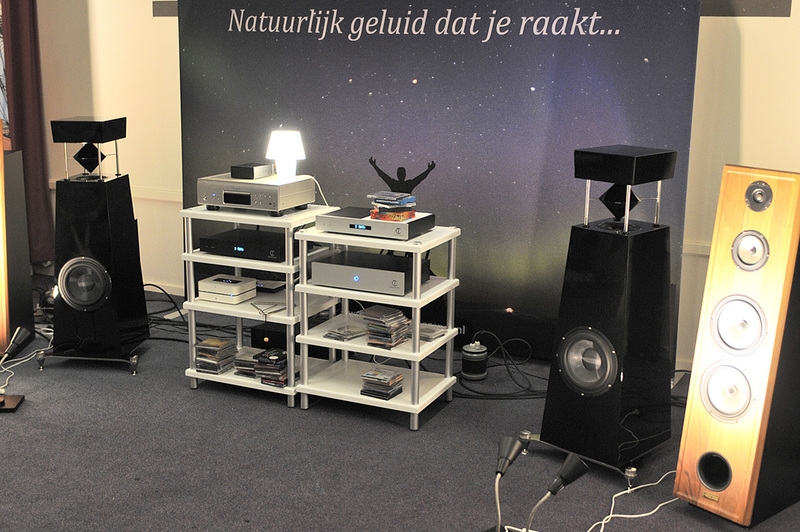 Temporal Coherence had brought their Diamant and Pyramide 360° omnidirectional loudspeakers. These Dutchies also offer a preamp and power amp present in the right rack. 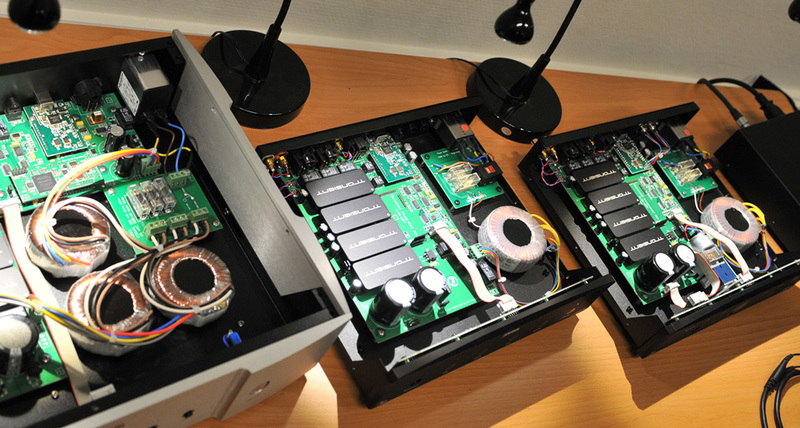 The active Diamant sports 4 built-in power amps with a claimed frequency response of 16-35'000Hz -3dB. 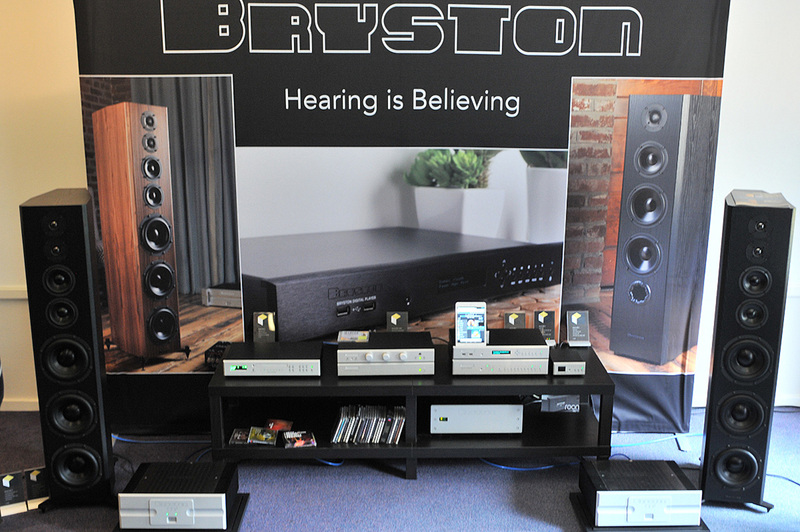 Bryston's Model T loudspeakers, Cubed power amps and various sources made for a full one-brand system. Such a philosophy makes one-stop shopping easy and customers are guaranteed that all their gear is matched to the same sound philosophy and engineering standards. Close encounters of the Metrum kind came in a small room where a variety of their gear was matched to their own loudspeakers. New at the show were the Onyx DAC and Jade DAC/preamp. 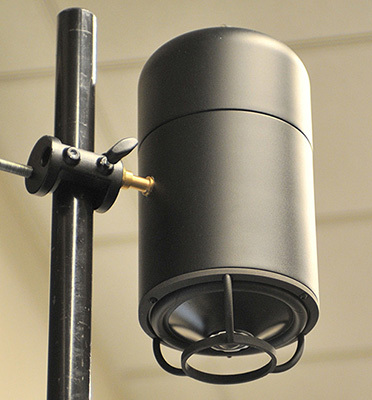 "The speakers are our own in-house designed full dipole design. There are no plans to make it available to customers as it would be a quite expensive system."